I’m reposting a photo I included in a ‘Travelogue’ post a few weeks ago, after a trip to Glasgow. Today I’ve been following the devastating news of the fire that seems to have destroyed much of this iconic building, important not just to Scotland and the UK, but also to the world of architecture and design. The whole building was very much unspolit, with the original features that Charles Rennie Mackintosh designed and crafted. The library in particular, which seems to have been in the worst affected part of the building, was a treasure of design and held an irreplaceable archive of material. Over the last few hours, as the extent of the devastation unfolded, I’ve been retracing the steps we took on our recent tour of the building, recalling the furniture, light fittings, room numbers, brass door plates and gazing from the windows that are now twisted and broken by the flames. So much of the interior was made of wood! 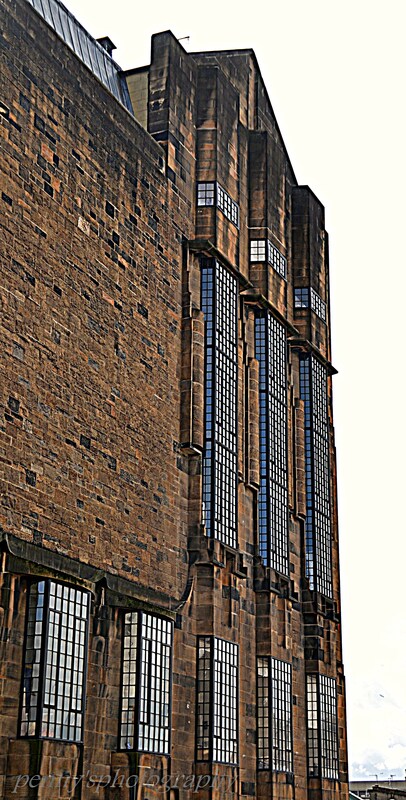 Part of the beauty of this building is that it is not simply a museum to the memory of Mackintosh, but still functions as a living, working school of art. To make matters worse many students were in the last hours of preparing their final exhibitions – so much hard work lost! So fortunate that everyone is safe! Already organisations are starting to talk of restoration, but they will never restore the true beauty of Mackintosh’s original work. Such a loss to the beautiful city of Glasgow.